Just recently the Private cloud adoption research has been released and i thought of writing the technical reason behind that adoption. There are multiple reason behind the adoption of these private cloud, it can be because of stability, the cost, flexibility of hypervisor support, supported features, available support and innovation behind the technology. VMware is in the leader and it has the highest adoption rate. of cause because the VMware hypervisor adoption rate is also high and now vCAC can manage multiple hypervisor. if i am not wrong then still the downside of vCAC is if you are managing multiple hypervisor the virtual networking (virtual router, Loadbalancer, Firewall, VPN, etc.) can not be implemented in different hypervisor managed by vCAC. We hope that this limitation will be removed soon by NSX. Also Cisco UCS and VMware comes under fulfillment and most promising tool because of their stability and support. Adoption of Microsoft CloudOS is less because i bereave that the underneath technology is still young and there are many things are on the way. I love all the opensource stuff and i was surprised when i show Apache Cloudstack is ahead of Openstack despite or recent features addition in Juno. Maybe the reason behind the Cloudstack being more promising and fulfilling with higher adoption ratio is because simpler deployment and recent feature addition in 4.4 and 4.5 version (eg. autoscaling). 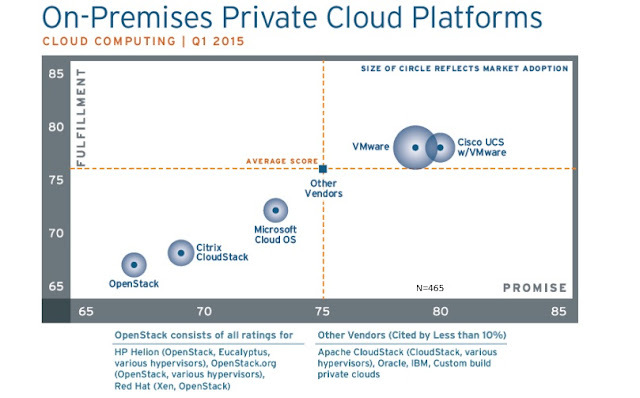 I am also curious to see the adoption on VMware distribution of openstack adoption in near future.